Luke Goodman Cinematography Blog: The best pair of work shoes ever! When Luke and I are out shooting weddings we work long days often in the hot sun, and are constantly on our feet. After some trial and error we both solved the problem of having a good pair of comfortable shoes to wear. If you work in the wedding industry you soon realize you need shoes that are both comfortable and "nice" if not "cute" for ladies. And heels just aren't an option, at least I can't do it. It can make all the difference in how tired you are at the end of the day when you're wearing poor shoes. I went through tons of brands of black shoes to find that perfect pair- you think the more you spend the better the shoe, only to realize you trash them every weekend shooting. Until I came to Crocs! (thanks to Tanja Lippert, who got me on them.) 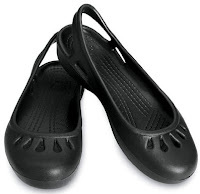 I always thought crocs looked kind of goofy and were probably painful since they look like plastic shoes. I have never had a more comfortable shoe! Not only do I wear them all day without blisters but I wear them barefoot, no socks or tights. They have breathable holes throughout so my feet stay cool, and the comfiest padded soles. Plus when they get dirty I just hose them off and they're clean again. They come in cute styles and colors too. Luke also found his ultimate comfort shoe- Rockport walking shoes. 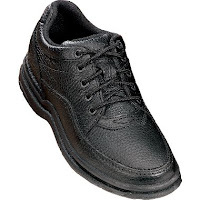 Comfortable and durable leather, he literally walks miles on these shoes and replaces them every year. These happen to work for us, and if you're still searching give these shoes a try, you might like them too.